In the previous year, 30% of ad budget was allocated to Facebook and Instagram and 28% was allocated to Google and Bing paid search ads. 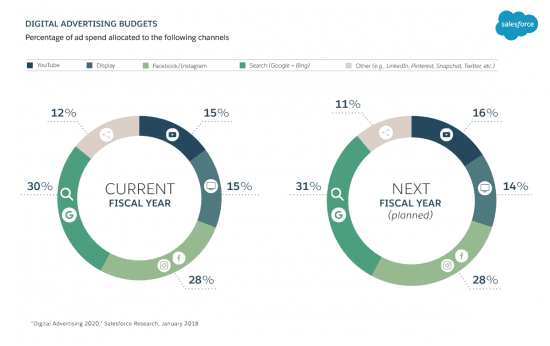 Facebook budget is expected to increase slightly by 1% to 31% and search budget allocation is expected to stay the same at 28%. Compared to other channels such as youTube, Display, and Linkedin, Pinterest and Snapchat etc. Facebook and Google are dominating the ad space with most ad budget allocated to them. Next year, 66% of digital ad spend will go to Google, Facebook, Instagram and Youtube. Over the last year, 65% of businesses have increased their video advertising budget, with more money going on video on Facebook, Instagram and Youtube. Some brands such as P&G are cutting digital ad spend though, stating that many brands are wasting too much money on ineffective digital advertising. They cite concerns about who sees the ads, ineffective targeting audiences being a key factor in their decision. P&G has since cut over $100 million of digital ad spend, which resulted in no negative effect on sales. As for the dominance of Facebook an Google, a lot of money might be going in their pockets, but marketers don't waste money, Facebook ads and Google paid search are just as effective as ever for marketers. But don't put your eggs all in one (or two) baskets, a combination of YouTube, Facebook Ads, Paid search and Google display network all work better in harmony. It's also going to be interesting to see how advertisers evolve to use Instagram and Facebook in a crowded world full of endless amounts of content.